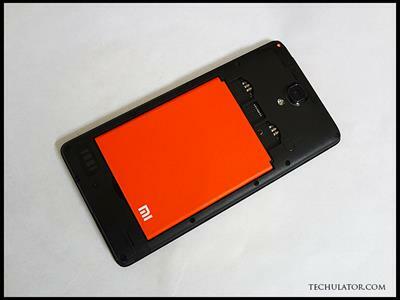 After successfully launching the Mi 3 and Redmi 1S, the Xiaomi Redmi Note was next in line to be released for the Indian smartphone market. 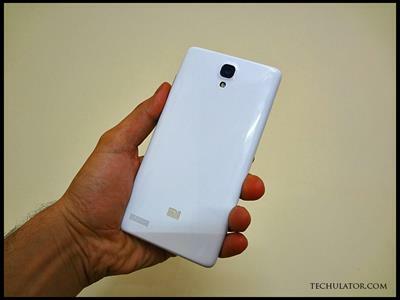 The Redmi Note was also displayed at the first Xiaomi India Bloggers meet that happened in New Delhi in July. The Redmi Note will be launched in two variants: 3G and 4G. The 3G variant is scheduled to be launched on the 2nd December 2014 online via Flipkart, whereas the 4G variant will be available via Airtel's official stores in various cities in India. This will however, be made available around December end. The first thing you notice when you open the box containing the Note is its size. The display on this device is pretty big. A 5.5 inch IPS display looks stunning even when its not turned on. This smartphone is a piece or art and looks brilliant. At the top is a front facing 5 MP camera that is capable of recording video at 720p and taking selfies with ease. The front facing camera is also equipped with face detection and works well. The front facing camera seems wide angled which means that you don't have to stretch your arm to infinity to get all your friends in the frame. An internal speaker with light and proximity sensors are located next to it. 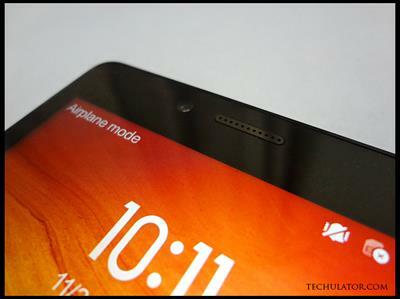 The 3 red capacitive buttons on the Redmi Note at the bottom are also back-lit unlike the Redmi 1S. You can control and customize its duration from the settings. The IPS display is super bright with brilliant colours and viewing angles. You would absolutely love this 5.5 inch display. The rear camera on this device is a 13 MP autofocus camera with an LED flash located just below it. The pictures come out sharp with negligible grain in bright conditions. It has a 28mm wide angled lens with an aperture of f2.2 capable of giving you wide angled shots with a good depth of field. The volume UP button on the smartphone is configured to work as a shutter release button while in the camera mode which helps in taking steady shots. The rear camera is capable of recording video at full HD 1080p and gives you the option of changing focus during the recording. The Xiaomi Redmi Note is a dual SIM smartphone and takes in 2 regular sized SIM cards. Between the two SIM slots, you would find a micro-SD card slot which can take upto 32GB of external memory. Just below it fits the user-removable 3100 mAh lithium-polymer battery that should be good enough to last for a day of heavy usage. 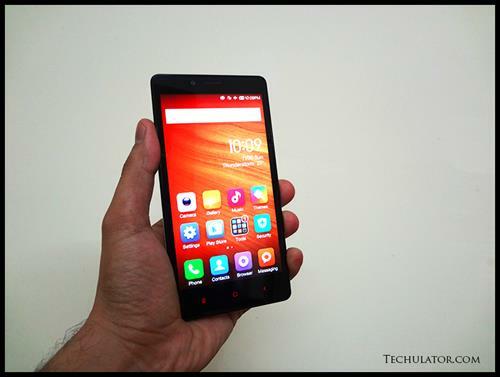 Question: Does the Redmi Note support OTG pendrive/keyboard/mouse etc? With no shortage of good stuff on the Xiaomi Redmi Note, I did indeed find a few average features. A large phone with a large display needs to be handled with care. The rear plastic panel on the Note is extremely glossy and shiny. It isn't slippery though and there seems to be a coating over the panel that should prevent it from slipping out of your hands. This device although weighs around 190-199 grams, it feels a bit bulky. The Note feels a bit thick with its 9.45mm depth. There's only one feature on the Xiaomi Redmi Note that I dislike, Android 4.2.2 Jelly Bean - the OS that powers this beauty. With Lollipop recently launched for new Android devices, I expected this device to atleast run on Mi3, Redmi 1S and the 10400mAh power bank, I am extremely happy to have the Redmi Note in my hands. This device will fly off the market from Day 1 of its release and I'm sure users would enjoy it as much as I am. With a price tag of INR 8999, this 5.5 inch Android device is a total steal and value for money. I wouldn't be surprised if it goes out-of-stock within the first few seconds of its release in India. I hope this article was useful to you, please feel free to comment below if you have any questions or queries regarding this product. Please Subscribe to our YouTube channel for your daily dose of tech news/video reviews on smartphones and other gadgets. Kudos to the author for listing out the features of Xiaomi Redmi Note along with its detailed specifications. 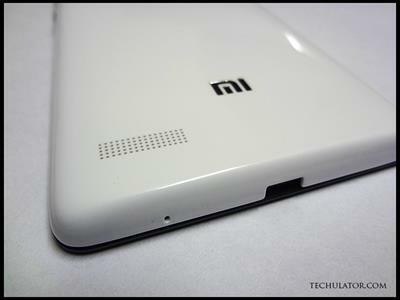 There is much hype surrounding this latest phone from Xiaomi following along the success of Xiaomi MI3 and Xiaomi Redmi 1s phones in India. Though I am disappointed that Xiaomi Redmi Note doesn't have the latest Android Lollipop, I am sure that this phone is a real steal especially for people looking for smartphones below 10K in India. 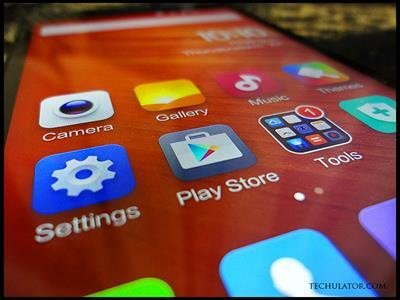 Yes sir, Xiaomi Redmi Note should have been loaded with the latest Android OS. But I think, this device would be preferred by all those who are aiming to purchase a Note or a phablet. It would be better if you mention the camera quality with images. Also you must answer the question in text for low internet speed user.